Aside from when its producers manage to wrangle together some noteworthy live performances, the Grammys are, by and large, the least culturally resonant awards ceremony that exist. This isn’t a new take, but it’s one that comes to mind when you see how much more impactful it is for a musician like Pink to receive a homemade award from her kids than one sanctioned by the Grammys voters. 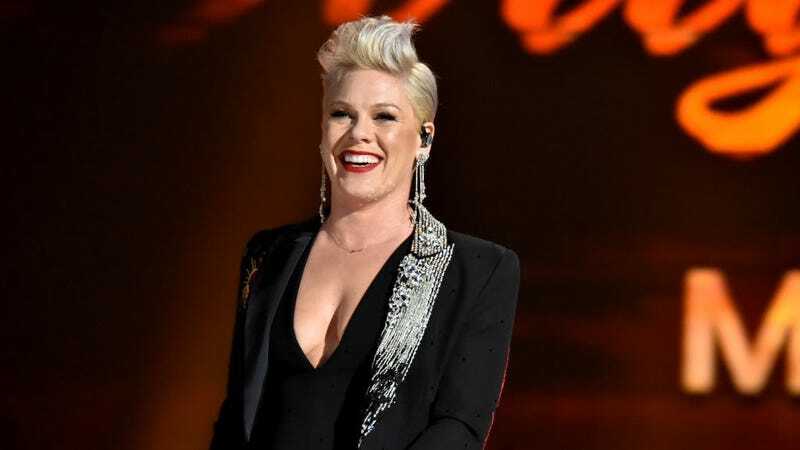 The tinfoil-and-Sharpie prize was given to Pink, whose Beautiful Trauma was up for Best Pop Vocal Album, after she lost out to Ariana Grande’s Sweetener. The loss, of course, matters about as little as anything can, especially when it’s coming from an awards ceremony that gave Greta Van Fleet’s From The Fires a Best Rock Album honor (we’re still smarting that, uh, Weezer’s Pacific Daydream and Fall Out Boy’s M A N I A lost out on that one). Still, there’s an adorable charm to the the singer’s seven year-old and two year-old banding together to craft a lumpy prize honoring their mom’s record nomination, misplaced commas and all. After all, the effort visible in their creation shows that they actually cared about the award, which is more than we can probably say for the real Grammys voting body. Here’s hoping Hollywood’s kids are taking note, as there will be plenty of tinfoil Oscars to sculpt before mom and pop come home cursing Bohemian Rhapsody’s maddening success, desperate for their children to assure them that we still live in a just and sane world.